The skin is the largest organ of the body and part of surgical anatomy, ranging in area from 0.25 m2 in the newborn to 1.8 m2 in the adult2. It consists of two layers: the epidermis and the dermis (corium) .The outermost cells of the epidermis are dead cornified cells that act as a tough protective barrier against the environment, including bacterial invasion and chemical exposure. The inner cells of the epidermis are metabolically active, producing compounds like growth factor, which help the ongoing replication process every two weeks. 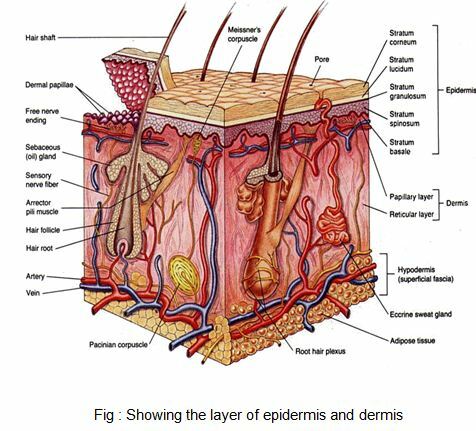 The epidermis contains five layers from bottom to top the layers are named: stratum basale, stratum spinosum, stratum granulosum, stratum licidum stratum corneum. There are three types of specialized cells in the epidermis i) the melanocyte produces pigment (melanin) ii)the Langerhans’ cell is the frontline defense of the immune system in the skin iii) he Merkel’s cell’s function is not clearly known. The second, thicker layer, the dermis (0.06–0.12 mm), is composed chiefly of fibrous connective tissue. The dermis contains the blood vessels and nerves to the skin and the epithelial appendages of specialized function like sweat glands. The nerve endings that mediate pain are found in the dermis. 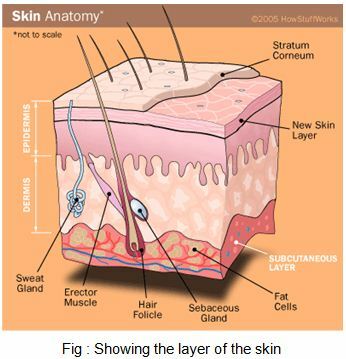 The dermis is a barrier that prevents loss of body fluids by evaporation and loss of excess body heat. Sweat glands help maintain body temperature by controlling the amount of water that evaporates. The dermis is also interlaced with sensory nerve endings that mediate the sensations of touch, pressure, pain, heat, and cold. This is a protective mechanism that allows an individual to adapt to changes in the physical environment. The two layers of the dermis are the papillary and reticular layers. The upper, papillary layer, contains a thin arrangement of collagen fibers. The lower, reticular layer, is thicker and made of thick collagen fibers that are arranged parallel to the surface of the skin. The skin produces vitamin D, which is synthesized by the action of sunlight on certain intradermal cholesterol compounds2.